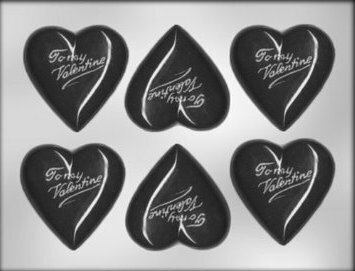 However, we live almost two hours away from a craft store, and the closest thing I could find in town was a baking pan with small heart-shaped cavities – much smaller hearts than I had pictured. Since I waited until the last minute, there was no time to order online, so…I made do. 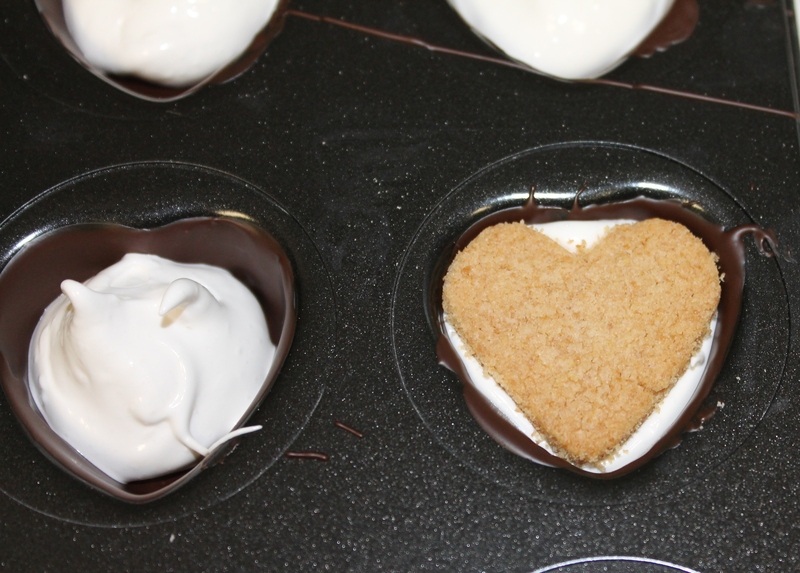 It worked, but it would have been SO much easier with a flexible candy mold. 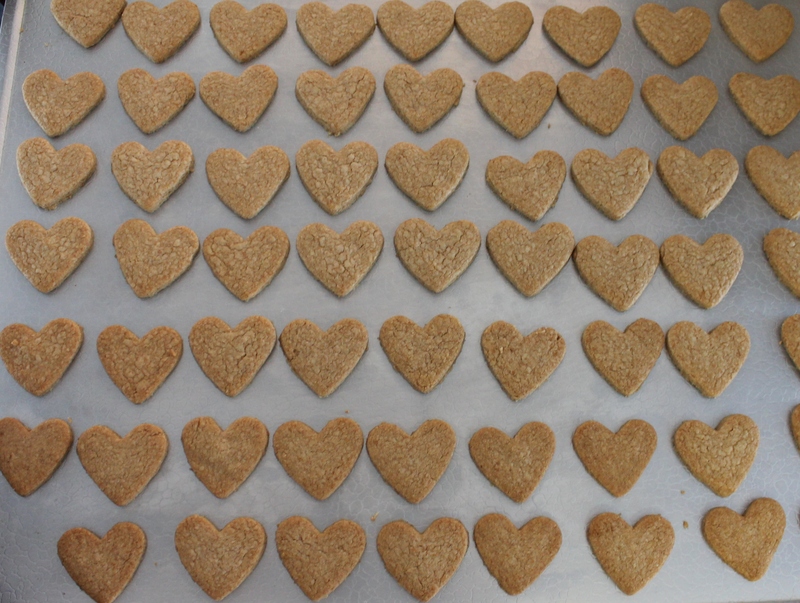 With one batch of graham cookie dough, eight ounces of chocolate, and one batch of marshmallow frosting, I made 12 Vallomar cookies, 6 large heart sandwich cookies, two pre-baked heart-shaped crusts, and had a pile of little graham hearts left over. That’s a lotta love! In large bowl (a stand mixer works best) beat butter, brown sugar, and powdered sugar until well mixed. Add egg yolk, vanilla, and milk, and beat well. Roll out on lightly floured surface. These should be fairly thin - no more than ¼-inch. Cut out desired shapes with cookie cutters. Place close together on baking sheet. Bake 9-10 minutes. Let them cool on the sheet for a few minutes and then transfer to a rack to cool completely. Cookies may be baked close together. 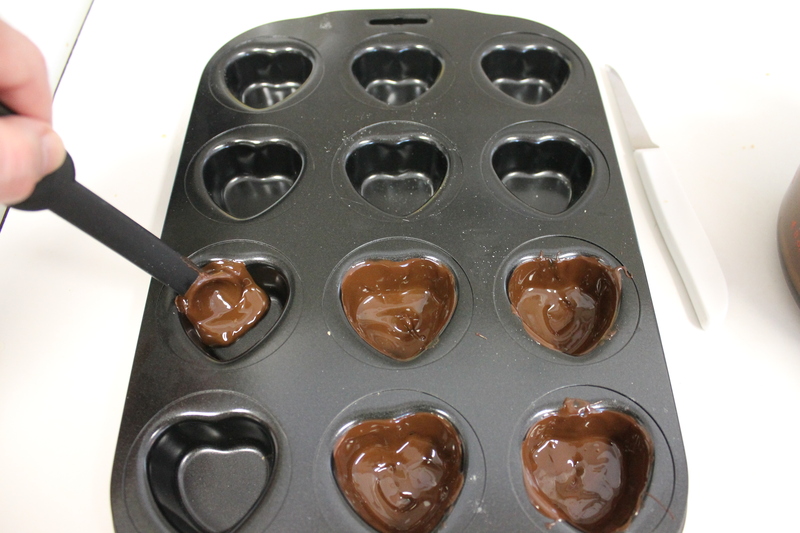 While your cookies are baking, you can coat the molds with chocolate and put them in the fridge. Use milk chocolate or dark chocolate, whichever you prefer. I melt mine in a bowl in the microwave, beginning with 30 seconds, and then 15 second increments (stirring each time) until the chocolate is melted. If you’re using milk chocolate you may need to add a teaspoon of shortening or coconut oil to make it thinner. It will take approximately a pound of chocolate if you’re making all of the dough into Vallomars. If you’re like me, after making a dozen or two you’ll just want to be done, so you’ll cut the rest of the dough out into larger hearts and slap some chocolate on one side, marshmallow on the other, and put them together. 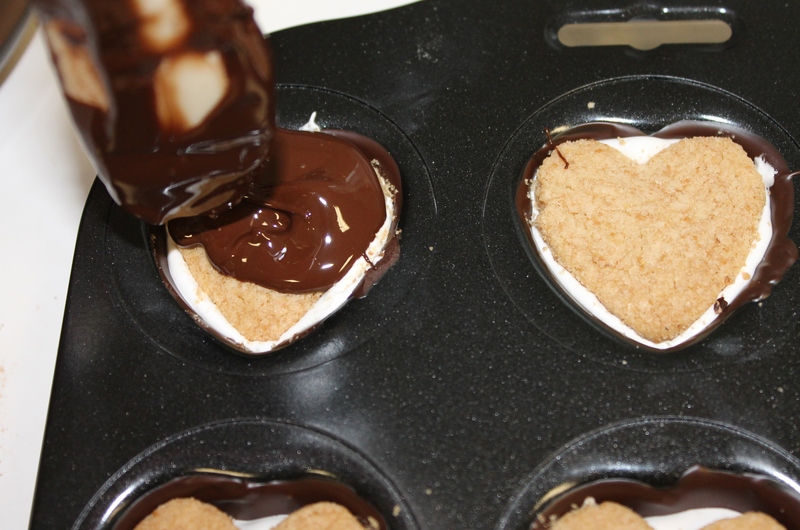 Much easier, and if you drizzle a little chocolate over them, they’re almost as pretty as the Vallomars. Almost. 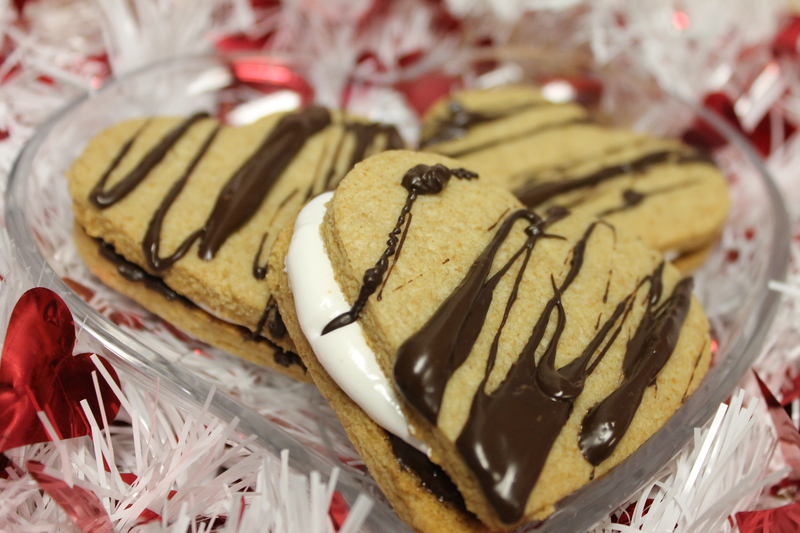 Graham cookies, marshmallow frosting, and chocolate. Yum! Coat the molds with a layer of chocolate. Some people use brushes, but a plastic measuring spoon worked well for me. So does a (clean) finger. Make sure you bring the chocolate all the way to the top of the cavity. Put in the refrigerator to harden. Repeat with another thin layer if necessary to coat completely. Coating the hearts with melted chocolate. While the cookies are cooling and the chocolate molds are chilling, make the marshmallow frosting. In a medium bowl, beat egg whites, salt, and vanilla at medium speed until foamy. Gradually add sugar, 1 tablespoon at a time, beating at high speed until soft peaks form and sugar is dissolved. In a small saucepan over medium heat, bring corn syrup just to a boil. Holding pan high above egg mixture, pour in a very thin stream, beating at highest speed until frosting is thick. Ready to assemble? Bring the chocolate molds out of the fridge. Fill one cavity (this is your test cookie) about 2/3 full with the marshmallow frosting (I used a sandwich baggie with the tip cut of and piped mine in) and top it with one of the graham cookies. There should be a little room around the cookie, and a little space on top. If the cookie is a snug fit, you’ll have to do what I did and use a paring knife to shave them a bit, because you want the chocolate on top to fill in between the cookie and the mold. If there’s no room on top for chocolate, don’t put quite as much marshmallow in the rest of them. Adding marshmallow frosting and a cookie. Now top each of them with enough melted chocolate to cover the cookie completely. Tap the mold gently on the counter to get any bubbles out. Pop the filled mold in the freezer for 5 minutes or so, until the chocolate is firm. Turn it upside down and tap gently. (Or if you were better prepared than I was and have a plastic mold, flex it a little.) The Vallomars should pop right out. 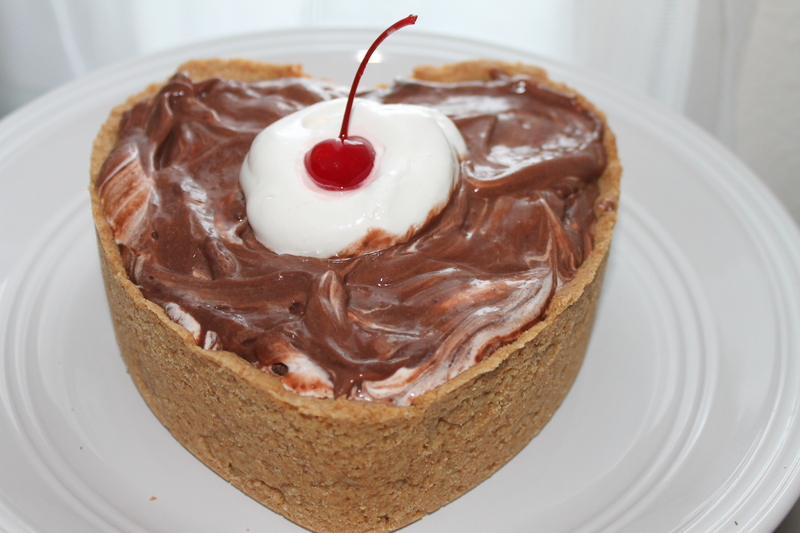 Fill with a layer of chocolate. This dough works well as a tart crust. Make sure it’s rolled thin and don’t over bake it, or it will get too hard to cut neatly. I even baked one in a small cake pan and filled it with chocolate pudding swirled with leftover marshmallow frosting and walnuts. 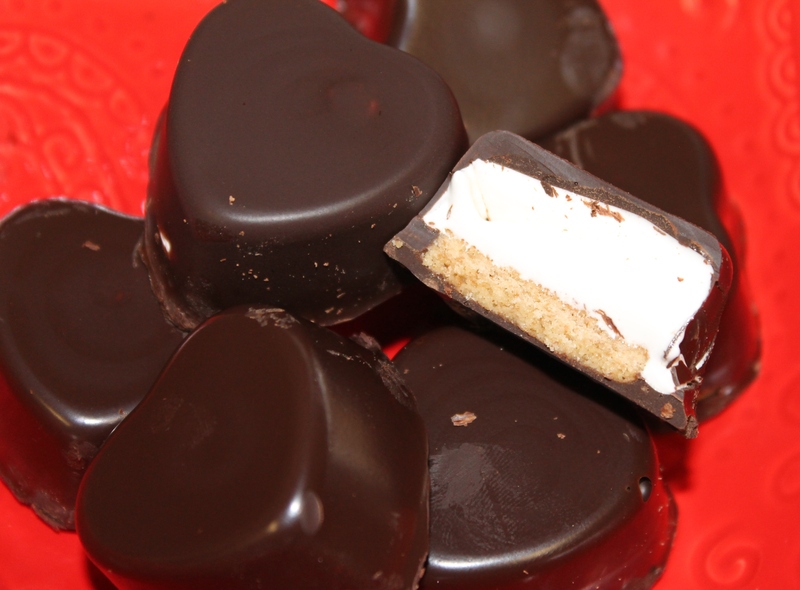 This entry was posted in cookies, Holidays and tagged chocolate graham cracker, chocolate marshmallow cookies, mallomar, mallowmar cookies by Lorinda. Bookmark the permalink. I think I’m going to swoon! These all look very very tasty!